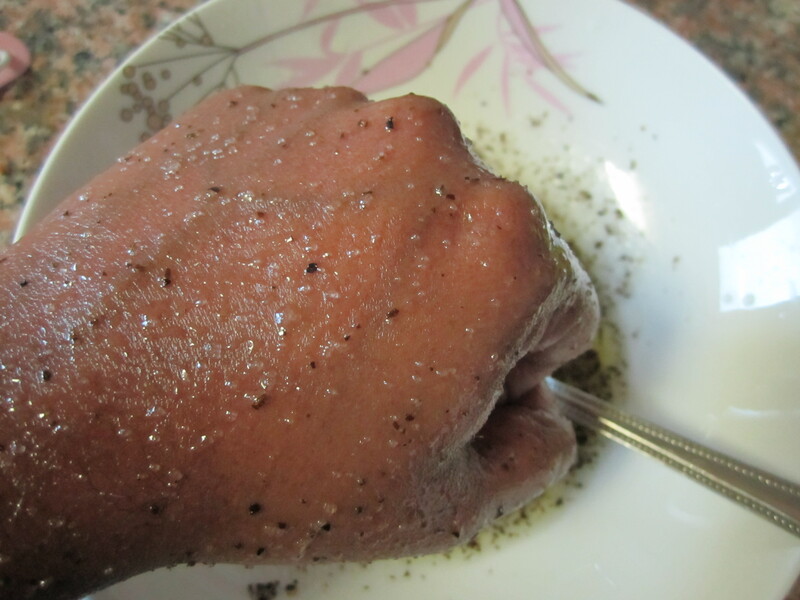 How to: DIY anti- ageing body scrub! 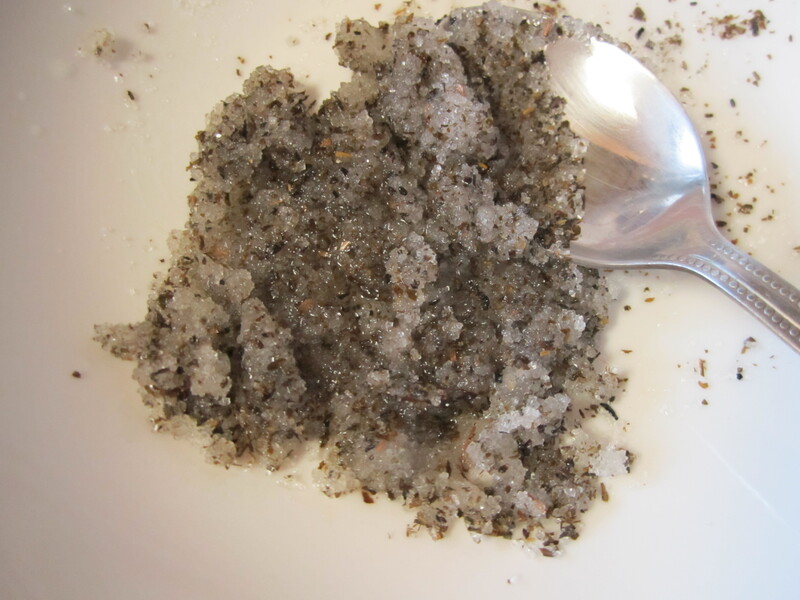 Today I would love to discuss and share with you a method to make an at home body scrub. It’s nourishing, softening and in the long run helps fade away dark areas like age spots. Olive Oil – It’s very moisturizing and helps the skin to be more hydrated. Shea Beautifying Oil from The Body Shop – It has a gorgeous smell and is a light oil. I wanted it’s smell to linger when applying this scrub. That’s the main reason I added it here. Not particularly for it’s moisturizing quality. I will do a more detailed review on this later on. Sugar (Right, that’s sugar in the Nescafe Gold bottle!) – It acts as our exfoliating agent. It is a humectant (something that attracts moisture from the atmosphere into the skin) and thus using sugar is always a better option than using salt. 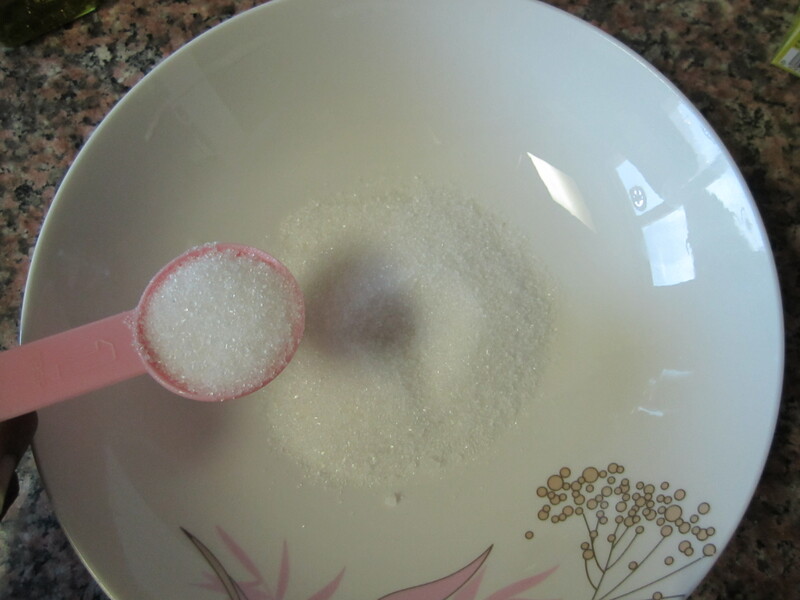 Also sugar has glycolic acid in it, which encourages cell turnover and helps generate younger looking skin. Green tea – It has anti oxidant properties. Also it contains AHAs (Alpha Hydroxy Acids) which work in a similar way that sugar does in the previous point I mentioned. It allows the dead skin to shed and helps newer skin to emerge. Lemon – It helps fade away dark spots and scars. The Vitamic C in it helps fight wrinkles and in brightening the skin. It’s great in exfoliating too. So as you can see, we have a powerhouse of ingredients here and all of them are probably already available at your home! 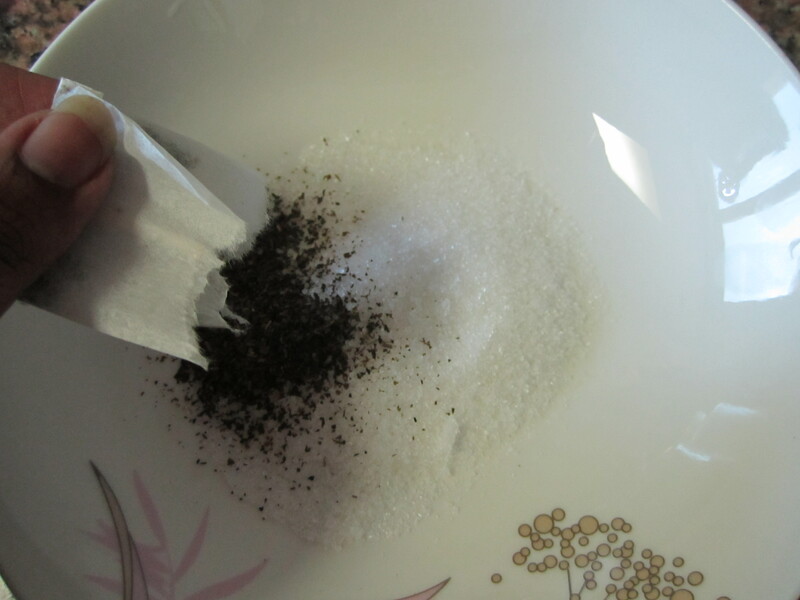 1) Add 3 tbsp of sugar into the bowl. 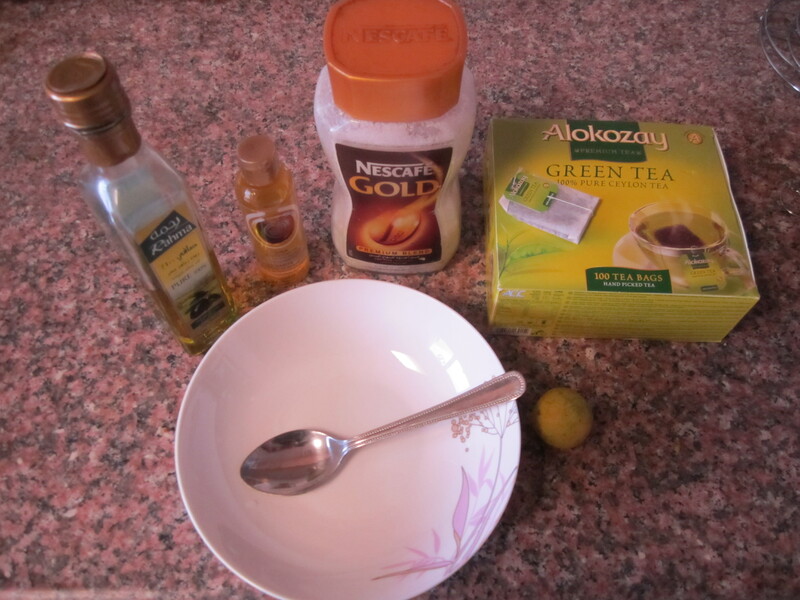 2) Take one bag of green tea (I use the Alokozay 100% pure Ceylon tea. One box of 100 tea bags costs AED11.45 at Nesto Hypermarket). Tear it open and add to the sugar. 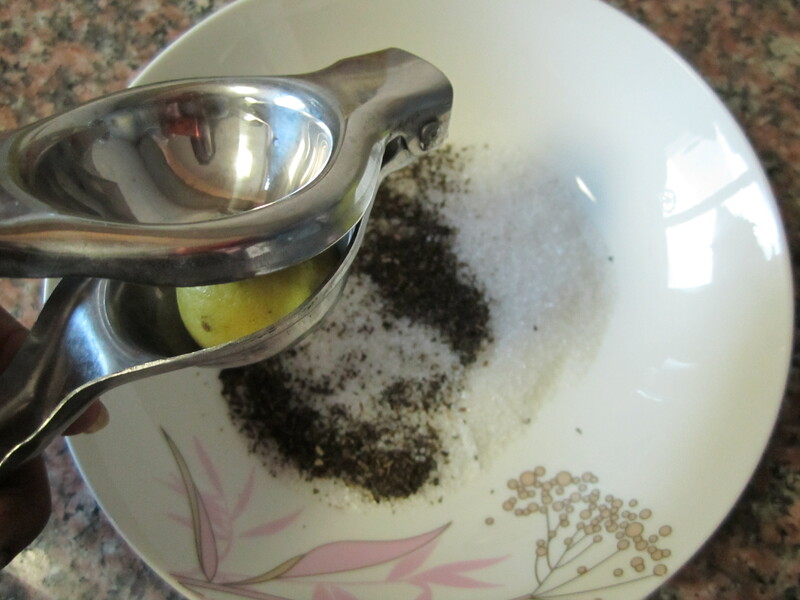 3) Squeeze the juice of one lemon into the mix. Give it a stir. 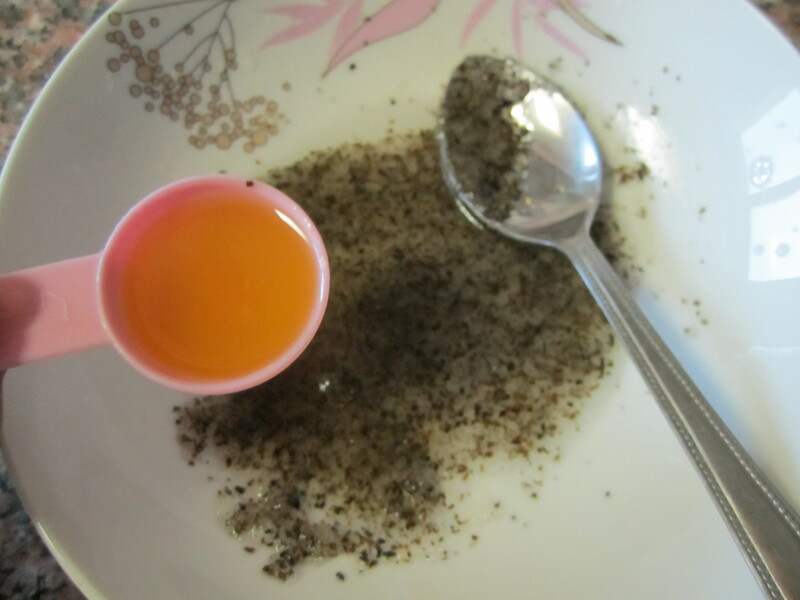 The mixture will look like this now. 4) Add 1 tbsp of the Shea oil. If you don’t have it, you could substitute it with 1 tbsp of coconut oil. 5) Add 1 tbsp of olive oil first. Mix it together and see if that’s the consistency you like. I personally love to add 2 tbsp of it, because I like the consistency to be bit more on the runny/oily side so it’s easy to work with. The drier the scrub, the more abrasive you will feel it to be. It looks like below finally. That’s the consistency I like. 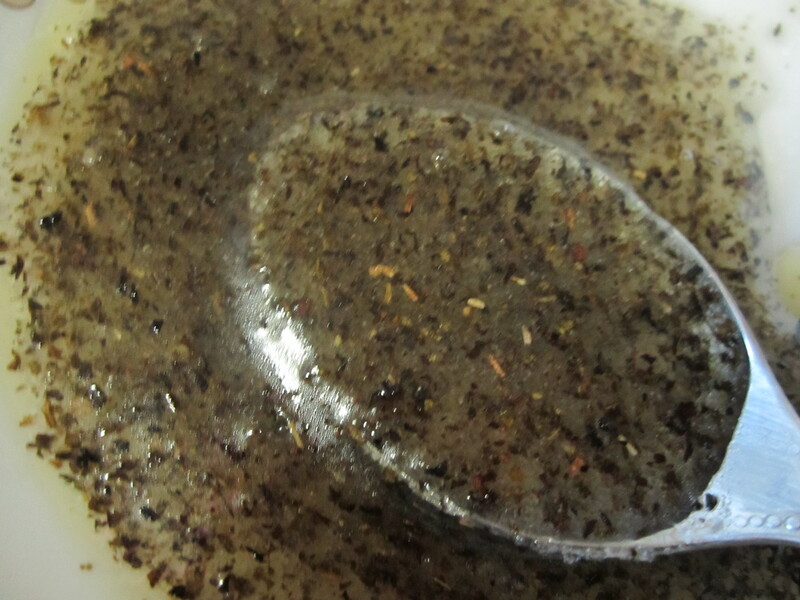 The mix looks slightly sparkly because of the slightest amount of shimmer in the Shea beautifying oil. Let this mix sit for a few minutes so that the green tea mizes really well with the rest. Here I have scrubbed it onto my hand. Once you do this, you are left with the softest skin ever! After each time of using a scrub (any scrub I mean), it’s best to use a body cream or lotion on your skin to keep it soft and get the best results. Keep this scrub on, for atleast 10 minutes so that it can benefit from the goodness of all the ingredients. This scrub is perfect for the winter. Surprisingly, during winter you skin get dehydrated more. The scrub helps keep the skin in optimum condition to receive your skincare and your skin reacts better to it. It’s best to use this scrub twice a week. Not more than that because you might irritate your skin. You can make small batches like I have done here. I actually used it on my hands and legs. If you want to do a whole body scrub, you will have to make more. Hope you like this DIY. Leave your comments below. I love feedback! WIll surely try this out and let you know.. Thanks, Chris!. Nice to see your comment :). Lemme know what you think of the scrub after you try it! Hi Hina!.. Thanks for your question. You can use it on your face however make sure you use fine sugar which has smaller size than regular sugar, so that there is only a mild exfoliation. The skin on our face is very sensitive when compared to the skin on our body. Hey thanks!. I am following your blog on Bloglovin now.. This is definitely good to soften the hands in the cold winter months over here in London. others like yoou aided me. Glad to hear that, ladyann ♡. Thanks for stopping by..
Looks good! Can I make a larger batch and keep it for a month? Thanks Ashvin, for stopping by my blog. I highly recommend making small batches of DIY products to keep it’s efficacy intact. In this specific scrub’s case, you can maybe make a bigger batch and add the lemon juice only at the time that you use it and not in the batch that you are keeping away for storage. Hope that helps.